Those words—spoken by CUNA Chief Transformation Officer Mollie Bell during the opening of the first, and judging by attendees’ reactions, not the last, WOCCU Global Women’s Leadership Network Executive Readiness Summit—summed up the event. They are the only way to really move the diversity needle, which is critically important for even greater credit union success. Calyn Ostrowski, WOCCU’s GWLN program manager, explained that GWLN was founded because credit union leaders like WOCCU President/CEO Brian Branch, Mitchell, Stankovic and Associates CEO Sue Mitchell, also the GWLN chair, and many others saw a lack of diversity in the upper ranks of the credit union industry. Yes, we know the oft-cited more than 50% of credit union CEOs are women, but when you drill down into the numbers, only about 15% of the CEOs at credit unions of more than $1 billion dollars are women. Want to join the movement within the credit union movement? Learn more about the Underground Community today! Women like Carla Cicero, CEO of Numerica Credit Union, and Teresa Freeborn, CEO of Xceed Financial Federal Credit Union, started counting the female CEOs around them, at national or community board meetings and other events, and the numbers were slim. Get on those boards and make a difference. Diversity is not an end in and of itself. It is a means for propelling your business forward! 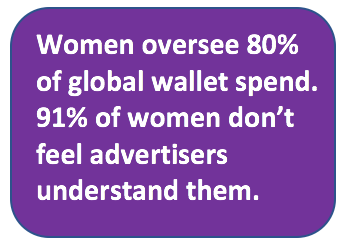 Women oversee 80% of spending in the household, feminist and tech entrepreneur Ingrid Vanderveldt, CEO of Empowering a Billion Women by 2020, pointed out during her presentation, but 91% of women feel advertisers don’t understand them. That’s a huge market disconnect that can significantly impact the success of your credit union or business. When you reach someone on their level, you create lifelong loyalty. Women have a different perspective from men. Take this example from Ingrid: a gun manufacturer wanted to start marketing to women, so what did they do? They manufactured pink guns. Real intimidating, right? When you’re a tiny little woman like Ingrid traveling alone at night, you don’t want a pink gun; you want a large, scary, powerful gun that’s also lightweight. That way you hopefully only have to flash it to scare off a bad guy rather than actually shoot someone, and it’s light enough you’ll be able to handle it. The same holds true for all types of diversity, be it racial, cultural, ethnic, gender orientation, socio-economic, disabled, etc. Different types of people have different perspectives, and we need them in positions of power and influence in companies to be able to better serve everyone. When you reach someone on their level, you create lifelong loyalty. Ingrid mentioned many times that she often refers business to Jan Scott at Texas Health Credit Union, because she helped Ingrid out with her business at the beginning of her career. Click here to begin your journey Underground! Just look at the power and influence someone like Ingrid has, and she refers business back to a credit union executive because Jan was willing to help her out when she needed it most, and Jan also benefits. If we can continue building up women this way together, engaging each other, learning and then acting on our lessons learned, we’ll be able to count women much higher at the upper echelons of the credit union industry, and that’s good for business and the members. The GWLN will be issuing a technical report around the start of the year that will include action steps for women, but really anyone who aspires as a leader, to follow and achieve success. It will include SuiteTrack Managing Partner Erin Wolf’s Unwritten Rules of Business, the importance of knowing your value from CU Innovate CEO Stacie VanDenBerghe, and more. Stay tuned!